Money is such a loaded topic. Most of us get emotional about money rather than dealing with it in a pragmatic matter. Many of us have huge fears about money (fears that we may or may not be conscious of) and those fears can hold us back in our lives. This guide helps identify those fears so that you can overcome their effect on your own life. 1. I will never have enough money. The biggest fear that most of us have is that we don’t have enough money and probably never will. We fear that we will work hard our entire lives and have nothing to show for it. We fear that we will never get out from under the massive amount of debt that we’ve accrued. It is important to change your mindset and reassure yourself that you do already have enough money. Learn to live within the income that you currently have. There is no way to know what the future will hold. Finding a way to work with what you have, however meager it may seem, gives you control over your financial situation. That control will ultimately allow you to make more money if you deem it necessary to do so in the future. Additionally, work on planning for the future by educating yourself about retirement savings and old age insurance options. 2. I don’t know what I would do if I had plenty of money. Believe it or not many of us have an underlying fear of what would happen if we actually had an abundance of money. This is usually not a conscious fear. We daydream about what we would do with billions of dollars. However, we worry that we would not actually know what to do with ourselves (that we would be valueless) if we didn’t have to work for our money. Many people waste money and sabotage themselves financially because of this unaddressed fear. Ask yourself honestly if this is a problem in your life. 3. I can’t understand money. Many people fear that money is a complicated thing and that they’ll never be able to understand it. They want someone else to deal with it. They don’t make smart financial decisions because they refuse to read the fine print, learn about investments and otherwise attempt to educate themselves about money. You really can understand finances if you work on it. Start small and work every week to learn a little bit more. 4. I have to be responsible for other people’s money. Many of us take on a lot of financial stress because of a fear that others we love can’t take care of themselves financially. If you are taking care of your aging parents or your adult children then you may be operating out of the fear that these people can’t deal with money themselves. Make sure that you are wholly responsible for your own money before you address how to help others in your family. After getting your own finances under control, put a realistic plan of action in place for helping others to be responsible for their own finances. 5. My money represents something important about me. Far too many people gain a sense of personal value from the money that they earn (or don’t earn). People have a lot of fears about how others will see them because of money. They may fear that people will think less of them if they don’t have enough money or even will think they’re snobby if they have too much money. What do you fear people see when they see your money? Are those fears holding you back? Address your fears and learn to separate your self worth from the money that you have in your bank account. Define what you consider to be a sign of success other than a big bank account. Determine what you think is important to have in your life regardless of how much it costs. 6. I will lose my job and not be able to earn money. This is a very common fear and one that is especially prevalent ever since unemployment rates started to climb. Unfortunately, it can hold us back in a lot of ways. We may stay stuck in jobs we hate because they feel secure or we may feel insecure about our jobs every day and cause ourselves a lot of stress as a result. It is important to come up with a backup financial plan in case this worst case scenario does happen. Having that plan will help you control the fear of job insecurity. 7. There is something wrong with talking about money. Many people still seem to think that talking about money, especially about their own personal finances, is a bad thing. 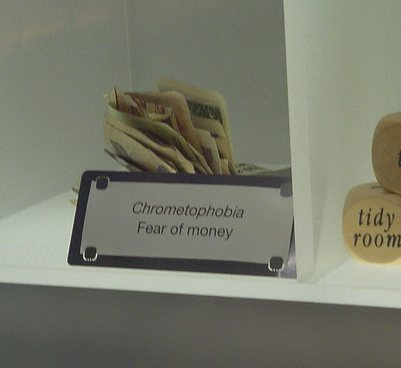 We have a big fear of talking about money. This problem exacerbates a lot of the other fears that we have about money. The only way to overcome this fear is to take those first tentative steps into talking about money with people you trust! I’d like to add one more: fear that you lose your savings. We have FDIC insurance for savings accounts at the moment, but our investment accounts for one could really lose value. In the course of history savers have often lost out in a currency crisis. So, even if you run your personal finances conservatively, you still run the risk that you lose a junk of your savings. @ ctreit – Thanks for adding that important point! I found point #3 to be very interesting: “I don’t understand money.” In my experience when most people say this what they really mean is, “I don’t want to understand money.” What do I mean by that? I’ve worked people before who are perfectly intelligent, they have masters degrees, they’re good people…and yet when it comes to working through the nitty gritty of their finances this wall will go up, they’ll get a glazed over look, and with almost no effort at trying they’ll simply say (in not so many words), “I just don’t understand money.” Again, it’s not that they can’t, they just don’t want to – often for some of the reasons you’ve listed in your post. I would think it would be more compelling and helpful if number three included links for people to actually do what you’ve suggested. Not only is it somewhat expected, I w0uld be stunned if Financial Highway wasn’t able to link to its own articles with advice and suggestions. It just seems odd that it’s missing. One of the biggest fears, related to number one, of senior citizens, who have scrimped and saved all their lives, is that Ben Bernanke’s Federal Reserve will keep interest rates near zero. These senior citizens, who understandably are risk averse at their age, put their money primarily into FDIC insured certificates of deposit, money market accounts, and other fixed-income savings vehicles. With rates of interest on their accounts pummeled-down to rock bottom by the Fed, many of our elderly savers who depend on income from these accounts, together with Social Security and pensions (if they are lucky), to survive on, have seen their monthly stream of income drop by sometimes as much as forty percent. Social Security did not have a cost-of-living increase for 2010 and is not projected to have a raise for 2011 either, yet food and fuel prices are set to increase due to surging in commodity prices to higher levels. It certainly appears that the elderly savers are being punished, by the Fed, with severely low interest rates on their savings for the malfeasance of the the big bankers and irresponsible home buyers and unscrupulous lenders. And these low rates seem to be forecast to continue, maybe for the next decade, as Japan has seen. Now that’s a worry. The majority of senior citizens cannot rejoin the workforce, and besides, there are no jobs anyway. Oh yes, take a look at how the casino stock markets are reacting to hints of even more quantitative easing by the Fed. They are rallying more, during September and this month, than in decades. This surge in the markets comes as the nation’s unemployment statistics are stuck near a ten percent level. When the most basic cost of living that involves a roof, food, and no more, exceeds your grasp, reading things like this just makes you feel more hopeless, as if you are the only person in the world who somehow does not have enough for LITERALLY the most basic of needs. Unless you’re suggesting people move into a homeless shelter, and eat once a week, this is simply not true for many. I was clueless before about financial issues, but then I realized, it is my responsibility to make sure my old age will not be of hardship, I read books, subscribe to financial magazines, learn about stocks, avail of 401k@ work, and have automatic investings, and open IRA w/ my local bank, have stashed some emrgency money, and put some of the extras in CD, I feel much better, and get a rushed everytime I checked my portfolio with ING. that google ad is in the way I can’t even close it and it is bothering me. I m sure it bother other reader. I was going to leave this page because of that stupid google ad in my face. but I went ahead and read most of the article but it does not really tell us how to over come it.